OnePlus becomes one of the first smartphone manufacturers to release the first build of Android 8.1 Oreo. Yes, the latest flagships from OnePlus are receiving Android version. OxygenOS Open Beta 6 for the OnePlus 5 comes with the latest 8.1 Oreo. Though Google has already released the Android 9.0 P Preview for the Pixel series, it may still take several months before the stable version is available. So enjoy the latest update we have for the OnePlus 5 or 5T and download Open Beta 6. The OxygenOS Open Beta 6 not only brings the latest Android 8.1 Oreo, but also features the new February 2018 Security Patch. You will also see the Oreo goodies like enhanced Picture-in-Picture, advanced autofill for passwords and usernames, new emojis, custom notifications, and much more. Apart from the Oreo goodies, OnePlus also brought some under the hood bug fixes like more clock styles for ambient display, new gestures for calls, global roaming solution, gaming mode and much more. For more details, see the full update log from below. Currently, the Android 8.1 Oreo OTA update is only available for OnePlus 5. The latest flagship 5T will soon receive the same with Open Beta 4. We have shared the link with you below where the new OTA will be live for the 5T device as well. The new OxygenOS Open Beta 6 brings Android 8.1 Oreo firmware update along with several new features. It also brings the newer February 2018 Android Security Patches. So download and install the latest Open Beta 6 full stock firmware and see how to install. The Android 8.1 Oreo only comes to OnePlus 5 for now. The OnePlus 5T may soon receive similar build of 8.1 Oreo with Open Beta 4. The following link will give you the Open Beta 4 for OnePlus 5T when its live. So stay tuned. 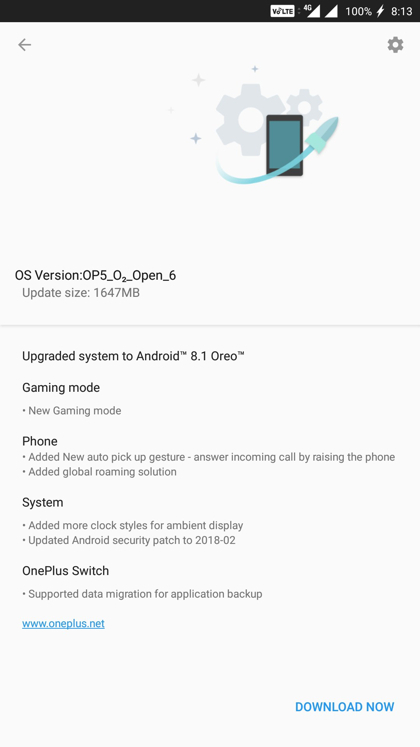 How to update OnePlus 5/5T to official Android 8.1 Oreo for Open Beta 6? 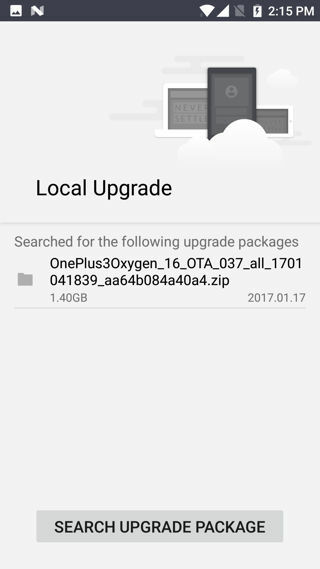 We have listed the full firmware packages and Local Upgrade method is the easiest way to update your OnePlus device to Android 8.1 Oreo. This can be used regardless of which Oxygen OS version your device is running. Download the OxygenOS Open Beta 6 or later. Get the full firmware package from above for the OnePlus 5/5T. 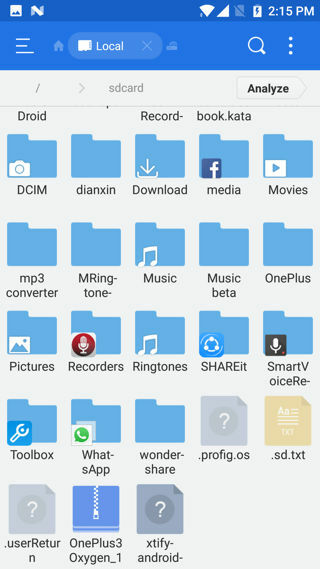 Transfer the Oxygen OS ROM file to the internal storage or phone storage. Place the zip file outside every folder. See the image below. Now go to Settings app, and visit System updates and tap on the top right settings icon. Choose Local Upgrade. Meanwhile, you can capture the OTA update using a VPN app. The OTA is live in regions of Germany and Canada. So download a VPN app like Opera VPN and change the location to the countries and check for OTA updates. But first, make sure your device is running the previous Open Beta 5. Later, go to Settings > System Updates > Check for updates. Download OTA and install using stock recovery or ADB sideload method. Next Entry How to root Android P 9.0?